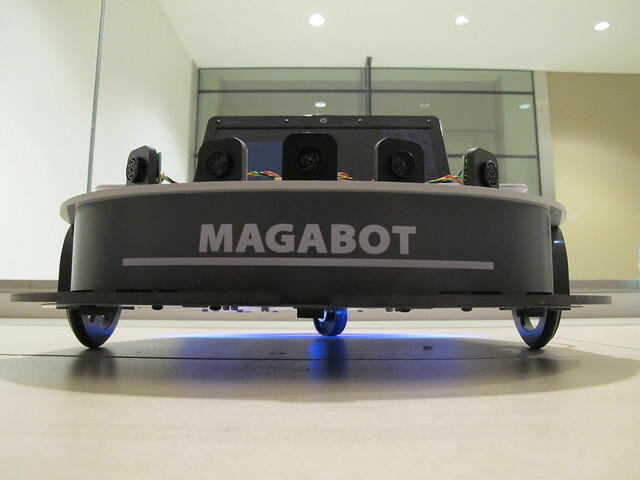 Magabot is an open hardware and software robotics platform designed to stimulate creative minds. Any robot with a computer is a very powerfull robot, and because all laptops have a camera, a screen, speakers, microphone, batteries and usb interfaces, your robotics experience will be empowered with Magabot. This project is being developed in a partnership with IDMind, Artica and with the participation of Francisco Dias. Many applications are being developed right now, follow colors, wall follower, face detection, among many others. We will provide interfaces for VisualStudio, .NET, c#, c++, openFrameWorks, Processing, Arduino, Flash, Unity3D, MAXMSP, PD and if you feel like you want to develop your own interface you will be welcome too, we give full credits on everything. You will be able to download apps for the Magabot, to develop your own apps, and if you feel they deserve money, you will be able to sell them too. The hardware is made with rigid PVC and a differential drive chassis with highly precise encoders on both motors at the commands of an Arduino and a customized shield. You’re completely invited to change and adapt it to your needs. – A 7.2v battery and a charger. – Other add-ons are beeing developet at the moment. We lauched the magabot.cc site today, this website will be a repository for informatiom, source code, apps, hacks, support forum, and a place to buy Magabots. If you buy one you will automatically enter on our beta test program, we invite you to share your experiences and to post your results, we will also provide you with support for you to be able to use it, change it, and play with it. The current price for the platform wthout the sonar kit is 250€ plus VAT. The current price for the sonars kit is 100€ plus VAT.